Ever wonder what the average SMS marketing click-through rate is for brands that include a hyperlink in their SMS messages? Maybe first we should explain what the term “click-through rate” is, so that we’re all on the same page. A “click-through rate” is the percentage of customers that when seen, click on a hyperlink within an SMS message. For example, if 10 customers receive your brand’s SMS message, and 2 of those customers click on the hyperlink in the SMS message, that would be a 20% SMS marketing click-through rate. So what’s the average SMS marketing click-through rate? According to our good friends at FunMobility, who evaluated all of their client’s SMS-click through rates in aggregate, determined that the average SMS marketing click-through is 36%. That means that for every 100 customers that receive an SMS message with a hyperlink in it, on average, 36 of them will click on that hyperlink. That’s pretty good, especially when compared to email marketing, which only has an average click-through rate of 3.2%. Combine an average SMS marketing click-through rate of 36%, with the average SMS open rate of 99%, you can see why so many brands are starting to insert links into their SMS marketing campaigns. How does an SMS marketer track their own click-through rates? It’s actually pretty simple with Tatango’s link shortening and tracking feature. How does it work? It’s actually pretty simple, and starts when you’re composing your SMS message. Instead of pasting the original URL into your SMS message, you’ll want to first shorten the link with Tatango’s link shortening feature. Once the link has been shortened, you can paste that link into your SMS messages. With Tatango link tracking, after you send your SMS message, you’ll be able to see in real-time how many of your recipients are clicking on the link. Pretty cool huh? 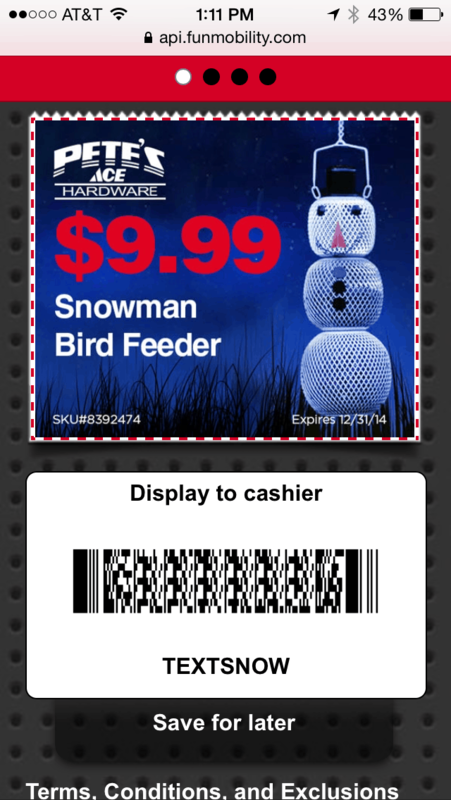 Want to see how Ace Hardware is using links within their SMS messages to drive traffic to their mobile coupons? Check out the example below.